We have a special episode of Sound Bites! We listen in on the informative and lively town hall meeting that took place on May 15 at the Enoch Pratt Free Library, featuring my interview with Christopher Leonard about his new book The Meat Racket: The Secret Takeover of America’s Food Business. Leonard, an investigative reporter, went looking to do a profile on the premier family in the poultry business, and was surprised at what he learned in the process. 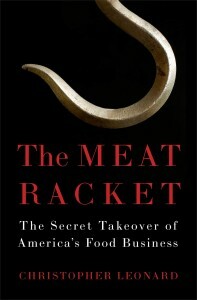 The Meat Racket reveals the inner workings of the corporations that control the food business, and the power in Washington of the meat and poultry lobbies. The town hall meeting was co-sponsored by The Marc Steiner Show/Center for Emerging Media, Food & Water Watch, Assateague Coastkeeper, and Baltimore GreenWorks. Mark your calendar for our next Good Food Gathering Town Hall, June 12 at 7:00pm, at the Franciscan Center, 101 W. 23rd Street in Baltimore, in conjunction with theFood & Faith Project at Johns Hopkins’ Center for Livable Future. We will talk about “Donating Well,” and discuss creative ways to provide fresh healthy food to our communities. Our panel of guests will include Christian Metzger, Executive Director of the Franciscan Center, and Arthur Morgan of Gather Baltimore and the Hamilton Crop Circle.